Dedicated couple of weeks working with product development / marketing team of Vembu Technologies which is a privately held, information technology company that specializes in developing software products in Backup, Disaster Recovery and cloud storage domains. Vembu’s products serve data center IT-Administrators in small and medium businesses managing VMware, Microsoft Hyper-V and Physical Server environments and was founded in 2002 and tested out some cool and exciting features. 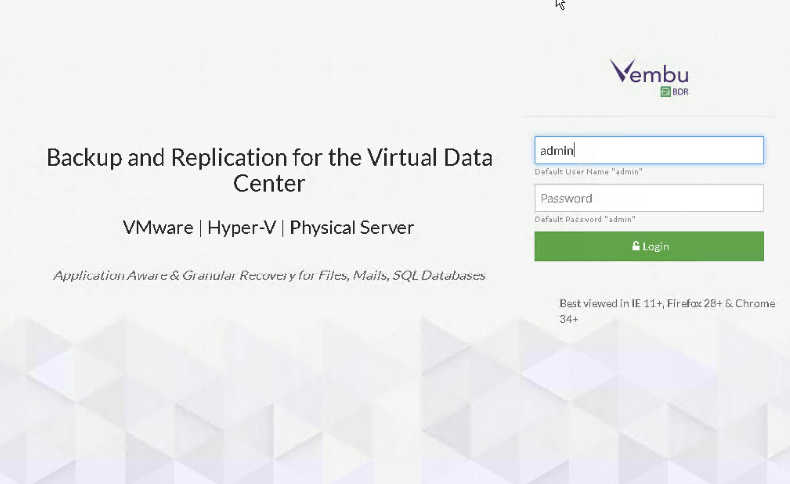 The most reliable, simpler and affordable Backup & DR product for virtualized environments, Vembu VMBackup provides agentless Vmware vSphere & Microsoft Hyper-V Backups with as low as $360 Per Cpu Socket Per annum for VMware VM’s and $240 per Cpu Socket per annum for VMbackup for Hyper-v thus making it a handy product for IT admins for their virtual environments. With entire Image-level Backup for Windows Servers & Workstations, File-level Backup, Bare-metal Recovery, Migration options from Physical to Virtual environments, Vembu ImageBackup is a comprehensive Backup & Disaster Recovery for Windows IT environments. Vembu ImageBackup supports from Windows Server 2003 SP2 upto Windows Server 2012 R2 and from Windows XP SP2 upto Windows 10. Furthermore, Desktops/Laptops Backup is completely free. For Servers, it is as low as $180 per server/annum per server. Vembu OnlineBackup is a user-friendly backup solution that lets you backup your Business Critical Data to our Secure Vembu Cloud. It includes File Backup, Server Backup, Application backup for MS Exchange​, MS SQL​​​, MS SharePoint & MS Active ​Directory​ with Granular restores. For OnlineBackup of application servers, the license fee is $72/application/annum, for OnlineBackup of file servers, the license fee is $24/server/annum, completely free for workstations with $0.20/GB/month as Vembu cloud storage fee. With SaaS applications taking over the CRM & other businesses, there are associated threats of data loss with it. Vembu SaaSBackup is designed to protect mails, drives & contacts in SaaS applications like Office365 and Google Apps with faster recovery options and rich UI. The cost for the same is $24/user/annum for Office365 and Google Apps respectively with $0.20 per GB/month as cloud storage fee. 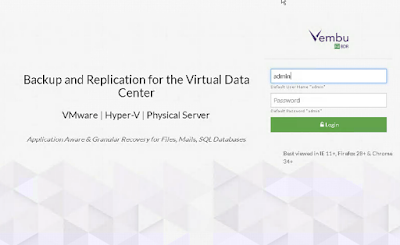 Vembu Offsite DR v3.6.0 which offers added data protection, allowing users to replicate data to their very own data center from backup server with a cost of $90 per cpu-socket/annum for VMware VM’s and $60 per cpu-socket/annum for Hyper-v.
Vembu CloudDR v3.6.0 offers added data protection by allowing you to transfer data to Vembu’s Cloud. There are multiple options for restores including booting a live VM on our cloud, anytime anywhere restore via internet or restored data can be downloaded to USB drive and shipped with a cost of $0.20 per GB/month both for VMware and Hyper-v environments. Vembu BDR360 is the centralized monitoring and management portal that provides end to end visibility to all your IT environment backed up using the Vembu BDR Suite products which is available for purchase for as low as $60 per cpu-socket/annum for VMware and $40 per cpu-socket/annum for Hyper-v.
Now that I was already fascinated about the pricing of Vembu Products thought of testing out some features and functionalities around Vembu BDR and take my experience with the product to whole new level, first thing first downloaded the executable file of Vembu BDR and logged in as admin, configuring the time zone was the first step which later followed by integration of the environment we are planning to backup. Next step was to integrate the environment we want to backup by either providing the details of our vCenter Servers or Microsoft Hyper-V by adding our Hyper-v hosts and the Physical image if in case we wish to backup physical servers and desktop by installing Vembu Image Backup Client Installer. 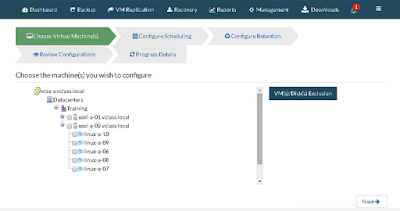 Proceeded further with VMware vSphere integration wherein I started by adding the Unique Vembu BDR ID - Provide Machine Name followed by the FQDN of my vCenter Server along with username and password and was able to fetch the details of vCenter Server and it’s associated hosts and Virtual Machines. From the inventory loaded selected one of my Virtual Machine named Linux-a-10 and proceeded further testing some features well I personally liked this one which provided me the options to exclude disks from that Virtual Machine which I don’t want to backup or maybe I only want to backup the system disks. Definitely a cool feature which made me think of recent use case wherein I was dealing with one of my customer’s environment in which they have a specific business requirements of including only the system disks and to exclude other disks as they contains static web pages which never changes. The virtual machine which I selected had only the system disks so proceeded further without excluding any disks. 1. Backup jobs enabled with application-aware image process option requires that your guest OS has latest VMware Tools, all the latest packages and patches installed. 2. Its recommended to configure Application Servers in separate backup job as application aware image process option can be enabled at backup job level only. 3. To perform application-aware image processing, you must provide guest OS login credentials for the selected VM(s) running MS Exchange server, MS SQL Server, MS SharePoint Server, MS Active Directory. Next task in the list was to configure retention so scrolled down with the available options we have when configuring retention, well we got two options Basic Retention where in we can specify how many retention points we need to opt out for and when the retention count for the incremental count is reached older increments will be purged and the latest incremental will be retained and Advance Retention option which help us to choose and configure the retention policy daily, weekly and monthly. 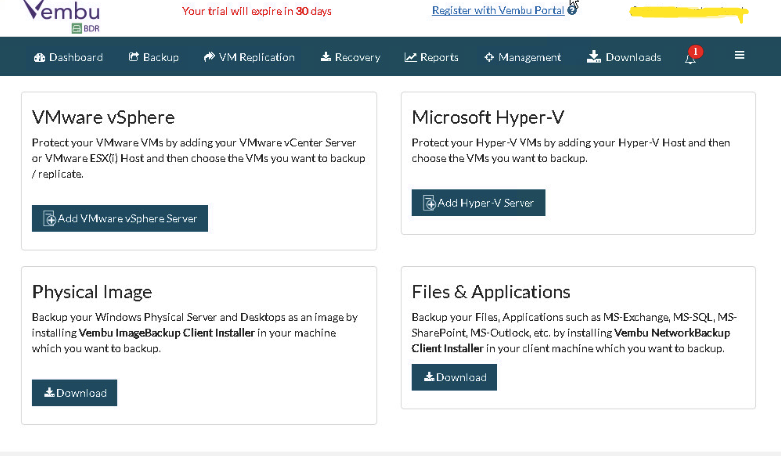 Now that we took the backup of the virtual machine it’s time to proceed further and checkout the features available with restore, as a matter of fact Vembu team really surprised me by showing a lot variety of options to select from. Instant VM recovery - This option help us to Recover Virtual Machines as Ready state which means the Virtual Machines would be instantly available helping us in maintaining the business continuity with minimal amount of downtime by specifying the target server and the target datastore. Live Recovery to ESXi Server- Helps us to restore the backed-up virtual machine directly to target ESXi hosts where we can also perform partial VM restore at disk level by selecting the vCenter Server datastore. File level Recovery – Option auto attach backup to Disk management in the local machine which allows instant access to the backed up data and give us a way to perform instant file recovery. Disk Level Recovery - Restores the VM backup at disk level where backed-up disks can be restored to target VM’s by specifying the details about the target VM. Download – This is one of another cool feature which provides a multi format restore for any images backup be it physical/ virtual. My Final Thoughts – It was time to talk about my final thoughts about Vembu BDR as a solution and there are couple of points which I would like to talk about and should be taken care when planning to consider your backup and recovery vendor. The Backup and Recovery Solution should be simple enough to setup and manage which we have recently seen when we have installed the Vembu BDR and as a matter of fact, I liked the GUI which provides us enough capability that we can manage VMware/ Hyper-v Environment from a single console. Thinking from an administrator perspective who is responsible to take care of both the Hyper-V and VMware vSphere Environment can now work on a single console rather than hopping in and out of various consoles. Backup and Recovery solution should be capable enough of creating multiple backup jobs which can be executed in parallel by providing the same performance for each of the backup job executed, well I tried to test the same and was focusing on the performance of each jobs being executed in parallel and I was surprised by the amount of time taken by both the jobs for completing the full backup of a windows VM and Linux VM as both of the jobs were executed within few minute and one job hasn’t impacted the overall performance of second job being executed in parallel. Another key note to consider when thinking about Backup and Recovery Solution should be the capability of the solution to provide backups of file servers and enterprise applications such as SQL and Exchange which is one of another feature provided by Vembu BDR application aware image processing where we can think about few prerequisites and move forward by creating any additional backup job. Pre and Post Sales support is another key area where we should look into when thinking about working with Backup and Recovery solution vendor and for this point Vembu Product/Marketing team deserves a Five Star as they have been very helpful throughout the product training/testing phase/.